Kingston, Ont., police have charged a prison inmate with three counts of attempted murder in the shooting of a family member of a patient at the Kingston General Hospital on Monday evening. According to Kingston police, the inmate, 32-year-old Corey Ward, disarmed a correctional officer inside the hospital and fired the gun twice at about 6 p.m. ET. One person was shot in the leg and suffered serious but non-life threatening injuries. The victim was a family member of a patient at the hospital, a hospital official confirmed during a news conference Tuesday. Ward was restrained and taken to Kingston police headquarters. He is charged with three counts of attempted murder, one count of aggravated assault, one count of disarming a peace officer and other weapons charges, police said. Ward was brought to the hospital for medical reasons in leg restraints and handcuffs Monday. Police said the handcuffs were removed to allow him to go to the washroom. Outside the hospital's washroom, as correctional officers tried to place handcuffs back on the inmate, the suspect allegedly grabbed the officer's firearm, police said Tuesday. Police said the suspect disarmed the officer even though the weapon had been contained in a three-stage holster, which means it normally can't be removed without significant effort. "We will be doing our own investigation of the incident, and any gaps or concerns or issues that need to be addressed will be dealt with swiftly," said Curtis Jackson, an assistant deputy commissioner at Correctional Service Canada. "I have no information at this point that there was a malfunction of equipment … I can say our equipment is of the highest standard, consistent with police agencies." Dr. David Messenger, an emergency room doctor and head of the Queen's University department of emergency medicine, which had medical students in the ER at the time of the shooting, said hospital staff are traumatized. "It was terrifying for staff. We spoke as a group after it happened," said Messenger, who arrived at the hospital about five minutes after the shooting. "This happened in a very crowded, busy area of the emergency department, steps from multiple other patients." He said the hospital has a "Code Silver" plan for dangerous weapons in the hospital, but it's extremely uncommon for something like this to happen. Staff did review these plans after a 2017 shooting at a hospital in Cobourg, Ont., about 150 kilometres to the west. "We see inmates in the hospital on a daily basis. It's not uncommon to have several inmates in the emergency department at any given time," Messenger said Tuesday afternoon. "Our institution has worked historically with [Correctional Service Canada] to develop protocols for optimizing security when inmates are present. Those protocols obviously will be looked at again." Messenger said that before the incident occurred, the hospital wanted to create a "separate secure area" within a new emergency room department to serve high risk patients. "We're eager to have a new facility that will allow us to incorporate that kind of feature," he said. 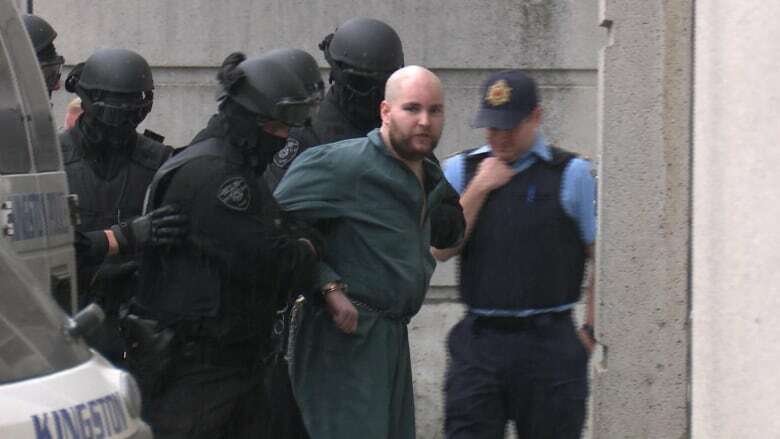 Messenger was part of debriefs immediately after the shooting and told CBC Radio's Ontario Morning that the man who fired the shots had been brought to the hospital to be assessed for a medical condition. Jackson said there is no indication that the incident was planned. "This is an extremely rare occurrence for us. I can't reference an incident of such, certainly in my 26 years of corrections," he said at a press conference Tuesday afternoon. Correctional Service Canada (CSC) said in a statement Ward was being held at the nearby maximum security Millhaven Institution and was being escorted by two correctional officers, as per its policy. The suspect is serving a sentence of 10 years and four months for uttering death threats, assault with a weapon and assault of a police officer in 2012. "All preliminary information indicates that the CSC staff acted courageously, diligently and professionally in responding to this unprovoked incident and were instrumental in bringing to a resolution as quickly as possible," a spokesperson said. "We will, however, continue to review the circumstances of this incident.… We will be thoroughly reviewing our procedures and policies and will make any adjustments required to ensure that the safety of community members and partners is protected." Ward will remain in custody at Millhaven Institution.